My makeover Monday project for this week started off as a plywood cut out silhouette of a running horse. I found it at a thrift store for $3 and thought it was neat, but I had no idea what I was going to do with it. 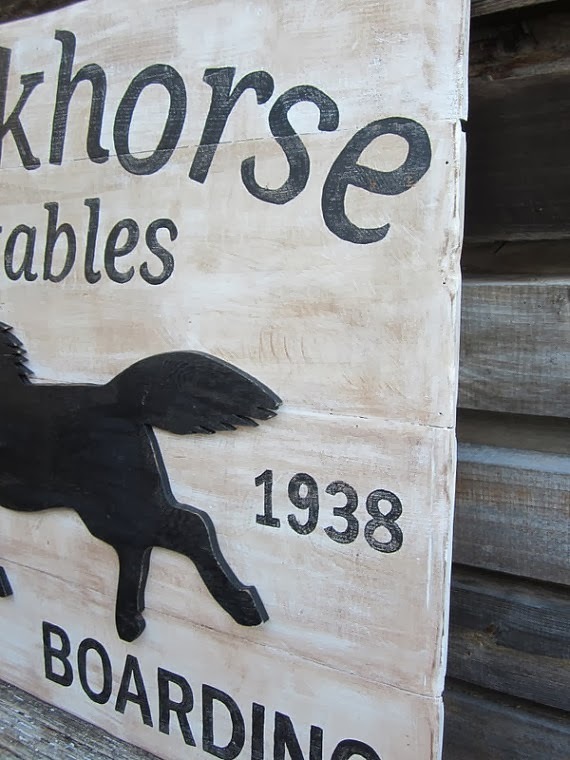 (it wasn't painted when I bought it, it was raw plywood) This horse had been stashed away in my workshop for quite a while and then... ...inspiration struck! 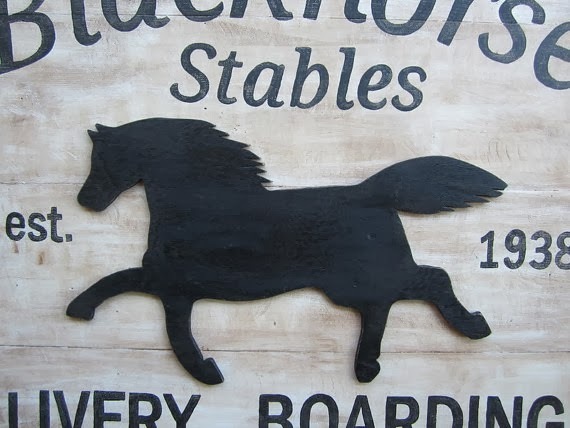 I decided to create a Livery and Boarding sign, using the horse as the focal point. I have to admit, I did not know what the word livery meant. I remember seeing the word used on signs in old westerns, so I looked it up to make sure it was appropriate to use for my sign. I started off by gathering four 1x10 inch boards from our lumber stash. I cut each board to a matching length. Then secured the boards together using wood glue between each one and screwing each board to a strip of wood along the back. I had to give my sign board a good sanding to get it ready to paint it white. The horse cut out needed to have some knots in the plywood filled with wood filler and sanded also, so that it could be painted. I painted him black The next step was to paint the words onto the sign in black. I printed the letters from my computer and traced them onto the board using the same chalk technique I used here. also hand rubbed on an antiquing finish, to give it an aged look. 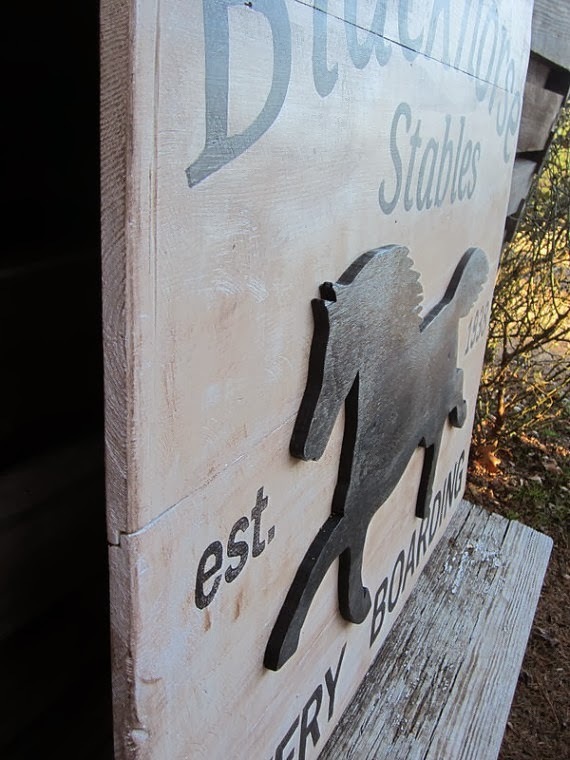 Lastly, I attached the horse cut out to the sign with screws. The sign is large - it is 42" x 37"
I guess this technically shouldn't be called a makeover. Do you ever purchase items with no idea what you are going to do with them? I'm trying to be better about that and only purchase something when I have a vision for it. because I passed it by when I didn't have a vision for it. I suppose there's a fine line there. I'm in LOVE with this sign and have been wanting to make something similar for so long. Bravo! What a great piece. It's so nicely distressed and I love the fonts. Thanks for the inspiration. Pinned! 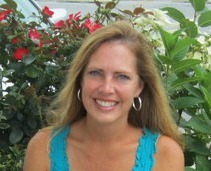 Maryann, thank you so much for pinning and the compliment! Thank you so much Sherri! I hope you are having a blessed week too. You are a blessing to me. Stunning, I love it and want it now :) How creative. Wow Dawn - thank you so much!!! 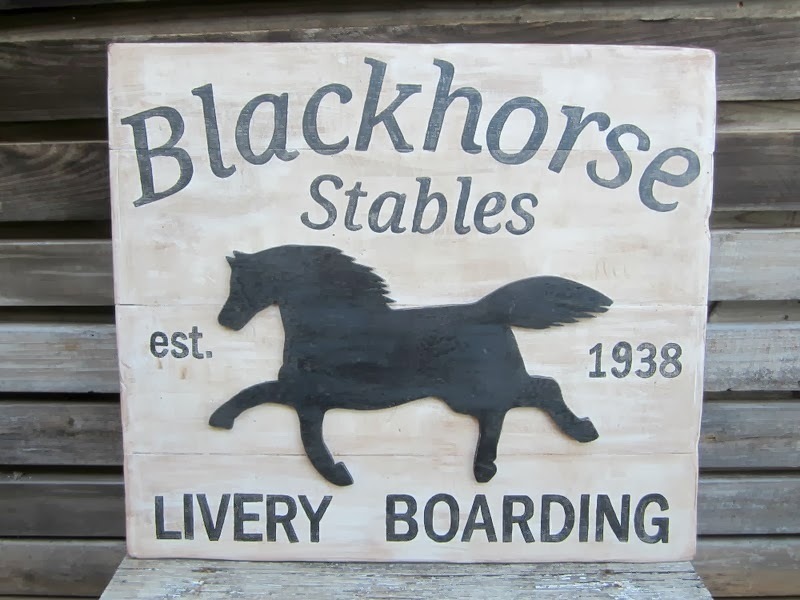 I'm such a sucker for cool signs, but throw in a horse and I NEED it! Lol! Great job!! I would love if you would link up to Give Me The Goods!! O my, this is so nice! This looks awesome! I love the 3d effect of the horse instead of just painting it on. Stopping over from Primitive and Proper. Thank you so much Kim. I definitely like the horse cut out on top too. It really is what makes the sign.